There are four groups of gorillas – Mountain gorillas, Eastern lowland gorillas, Western lowland gorillas and Cross River gorillas. Mountain gorillas live in the misty mountains of Central Africa. They have long hair, which protects them from the cold. 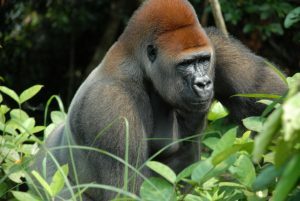 Eastern lowland gorillas are the largest primates. They live in DR Congo in Africa. Western lowland gorillas are smaller than other gorillas. They have reddish or gray fur and they also live in Africa. The Cross River gorilla is almost extinct. There are only 300 Cross River gorillas left in the whole world! Adult male gorillas eat 45 pounds of food per day. Find out more all about gorillas! All gorillas are social. They stay in groups called troops and they protect and care for each other. Gorillas eat mostly fruit and plants. Sometimes they eat insects or small mammals. Adult males have silver fur on their backs, which is why they are called “silverbacks.” One male is the boss of the troop. Gorillas are the heaviest of all primates. Some males can weigh between 300 and 400 pounds. Most girls weigh around 200 pounds. Gorillas have arms that are longer than their bodies. They move by walking on the knuckles of their hands. Ouch! Silverback Gorilla: He is dominant male and in charge. He also settles fights. Adult male gorillas eat 45 pounds of food per day. That’s a lot of food! They spend hours looking for fruit, insects and plants. Sometimes they raid farms and trample crops. This makes farmers angry. 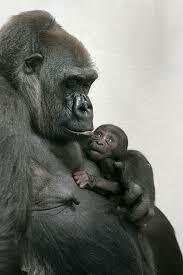 Female gorillas can have babies when they are 10 years old. They usually have one baby every four years. Babies can walk when they are 3 to 6 months old. They stay with their moms until they are about eight. Gorillas like to eat in the morning and evening. During the day, they play, take naps and groom each other. They comb each other’s hair and pick out bugs. The dominant male silverback is in charge. He settles fights and tells the other gorillas when to get up, where to go for food and when to go to bed. Gorillas make nests to sleep in out of leaves and branches. Gorillas communicate through facial expressions. They also grunt and screech, but they are quieter than orangutans and chimpanzees. They use hand gestures and body language too. A news clip about two gorilla brothers separated for 3 years. Question 1: Do gorillas fight? Answer 1: Gorillas are usually peaceful. Sometimes they fight if a young male tries to take over. The dominant silverback screeches, yells, and charges, but usually doesn’t hurt the younger gorilla. 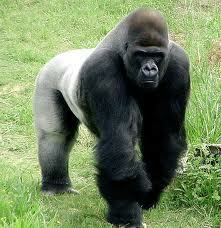 A silverback is a large male Gorilla who is the head of the family. Question 2: Do Gorillas stay in one place? Answer 2: Gorillas move every day to find new food. The dominant silverback chooses the new place. Question 3: Where do Gorillas sleep? Answer 3: Gorillas make nests of leaves and branches. They make one nest for their daytime nap and another nest at night. They never sleep in the same nest twice. That’s a lot of bed making. 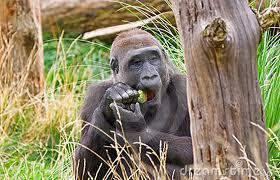 Question 4: What do Gorillas eat in the wild? Answer 4: Gorillas have a very healthy diet and like to eat bamboo shoots, fruit and stems. If you don’t like creepy crawlies you won’t like what gorillas love as a snack, they love termites and ants….yuk. Question 5: How often do Gorillas give birth? Answer 5: Female Gorillas give birth to one baby every four to six years. Question 6: Do Gorillas live alone? Answer 6: No Gorillas do not live alone, they are very social and live in families that can be very large with some families having forty or more. Question 7: How long do Gorillas live in the wild? Answer 7: Based on data from experts Gorillas live on average 40 – 45 years in the wild. Question 8: How strong are Gorillas? Answer 8: Gorillas are exceptionally strong. It is estimated they are 10 times stronger than humans. Never approach a Gorilla. Question 9: Where do Gorillas live? Answer 9: Gorillas live in Africa, in the tropical rain forests. The following African countries are very lucky to have these beautiful animals: Democratic Republic of Congo, Uganda, Gabon, Rwanda, Nigeria and Guinea. Question 10: Why do Gorillas pound their chest? Answer 10: A Gorilla will hit his chest to show signs of dominance in the family. A pounding of the chest can also act as a warning sign telling other Gorillas to back off or face a fight. Enjoyed the Easy Science for Kids Website all about Gorillas info? Take the FREE & fun all about Gorillas quiz and download FREE Gorillas worksheet for kids. For lengthy info click here. Declan, Tobin. " Gorilla Facts for Kids ." Easy Science for Kids, Apr 2019. Web. 21 Apr 2019. < https://easyscienceforkids.com/all-about-gorillas/ >.